But Ingalls knew how to coach, work with his assistants and motivate his basketball players. For his accomplishments, Ingalls was inducted into the UP Sports Hall of Fame Saturday night. Ingalls and nine others were honored at the 47th annual UPSHF Induction Banquet at the Island Resort and Casino. 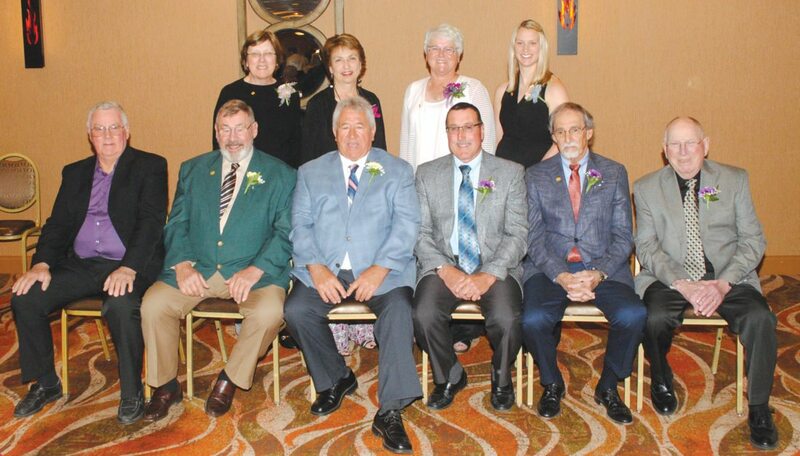 The other honorees were Ironwood’s Ingrid Gallo, Marquette’s Herb Grenke, Kingsford’s Rich McCarthy, Marquette’s Jim Karabetsos, L’Anse’s Don Michaelson, Eben/Munising’s Walfred (Mike) Mickelson, Iron Mountain/Menominee’s Pete Pericolosi, Ishpeming/Negaunee’s Karen Plaisier and Ishpeming’s Sarah (Stream) Stanek. Also honored were the UPSHF senior student-athlete scholarship winners — Negaunee’s Clara Johnson, Lake Linden-Hubbell’s Laura Lyons, Marquette’s Luke Rambo and Ewen-Trout Creek’s Jake Witt. McCarthy, who earned 11 letters in four sports at Kingsford High School, excelled as an athlete and high school coach in the Muskegon area for 32 years before his death in 2003. McCarthy lived with serious health issues his whole life and had four kidney transplants and one liver transplant. McCarthy was a three-year starting quarterback at NMU, where he owned 10 school records and was MVP of the 1969 team. In Muskegon, McCarthy served as head coach at Oakridge High School for five years and was an assistant coach for 21 years at Orchard View and Reeths-Puffer. He also was girls track coach for 12 years at Reeths-Puffer, earned Michigan’s Assistant Coach of the Year in 1997 and was selected to the Michigan High School Football Coaches Hall of Fame in 2007. “Rich loved life,” McCarthy said. “He loved his family. He had a strong faith and he sure did love the UP I know he would be extremely grateful to be getting this award tonight. He’d also probably say he didn’t deserve it. Even though he had a stellar college and high school record, he was a very humble guy who never sought accolades for himself. Don’t get me wrong he was a fierce competitor and he liked to win as anybody who played with him or against him would attest. Pericolosi, an All-UP basketball player at Iron Mountain, left his mark at Menominee with a 30-year career as boys’ varsity basketball coach. He compiled a 366-253 record, with one Class B regional title and quarterfinal victory. He led the Maroons to six district crowns and 11 Great Northern Conference championships. Menominee was named Class AB Team of the Year 13 times under Pericolosi and he was a two-time UP Class ABC Coach of the Year. In addition, Pericolosi also was a game official for 40 years. Pericolosi thanked his family, friends, assistants and former coaches. And he put in perspective coaching basketball at a school with a storied football tradition. “It wasn’t easy coaching in Menominee,” Pericolosi said. “If you don’t know, Menominee is a little bit of a football town. Just a little bit. The running joke was, well, the football team scores more points than the basketball team. And the sad part about it, it was true. Stanek was due to deliver her second child Saturday, but it didn’t stop her from attending the banquet. Stanek excelled as a talented point guard at Westwood, leading the Patriots to the 2003 Class C state championship. She was the UP Class ABC Player of the Year and earned all-state. Stanek, who now resides in Iron Mountain, ranks as the school’s all-time scoring leader with 1,842 points. At Michigan Tech, she owns the career assist record (459) and is sixth with 1,464 career points. Stanek, who was the GLIAC Freshman of the Year, was a three-time team captain and MVP in 2006-07 and started a program-record 126 games. Stanek thanked her parents, siblings and coaches along the way. Ingalls, an East Jordan native, compiled a 263-159 record, which included 14 seasons at Gladstone and seven years at Vestaburg. He was the UP Class AB Coach of the Year four times and led the Braves to two Class B quarterfinals. In his career, Ingalls also coached track, football and Little League baseball, while serving as a volunteer coach for the five-time state champion St. Ignace LaSalle girls basketball teams. Ingalls also excelled as a fastpitch softball hitter-outfielder during a 14-year career. Ingalls thanked the Gladstone administration, his assistant coaches like Dave Lahtinen and Karl Dollhopf and the many players who bought into his program. Gallo, who won the 1972 UP Ladies Golf Association championship in 1972, played on the University of Minnesota women’s golf team (1974-76) and won the Big Ten title in 1974. She qualified for the 1978 US Open, became a golf teacher and is among the top instructors in Minnesota. Gallo also earned four letters as a skier in high school and won the UP slalom in 1972. Grenke, a native of Oconto Falls, Wis., excelled as the head football coach at Northern Michigan University from 1983-90 while compiling a school-best 53-28-1 record. He also served as defensive line coach for NMU’s Division 2 championship team in 1975. Grenke, who served in the Marine Corps and played football at the UW-Milwaukee, had other coaching stints at UW-Platteville and Northern Illinois. Grenke thanked his assistant coaches, especially Buck Nystrom, players and the family culture that was created on his watch. “We didn’t block and tackle anybody, so what this is about is the players,” Grenke said. “I am here because of the players. I told them three things — believe in yourself, believe in each other, care about one another and they did that. And we won a lot of games. We won a lot of championships. Plaisier made her marks as a three-sport high school coach over four decades and a standout golfer. She coached Negaunee boys and girls golf teams from 1990-2011, leading the boys to the UP Class A-B title in 1993 and Class C in 200. She also coached Negaunee girls track, winning four UP Class C titles. In addition, Plaisier was the Negaunee girls basketball coach from 1975-84. Plaisier wanted her teams to play loose and have fun. In golf, Plaisier claimed 20 Wawonowin Country Club women’s titles and won more than 100 tournaments in the UP and Northern Michigan. She also was 65 years old when she won the Upper Peninsula Ladies Golf Association championship in 2015 for the first time after finishing second six times. She has five UPLGA senior titles under her belt. Winning the UPLGA championship at 65 was special, Plaisier said. Karabetsos earned 11 varsity letters in four sports at Marquette Graveraet High School and was a four-year letterman at NMU on a basketball scholarship. He was team captain in 1961-62, helping NMU to a school-best 24-3 record in 1960-61 highlighted by a home victory against Michigan State University. He was head basketball coach at Ashland, Wis., and an assistant at Kansas University. He also was head coach for two seasons at Denver, where he coached against UCLA and legendary Coach John Wooden. “What a treat it was to coach against (Wooden) and to play against players like Bill Walton, Henry Bibby, Larry Farmer and many other players who became excellent NBA players,” Karabetsos said. Karabetsos also served as assistant athletic director at the University of North Dakota from 1982-86 and spent 13 years as professor of sport management at Western Illinois University. 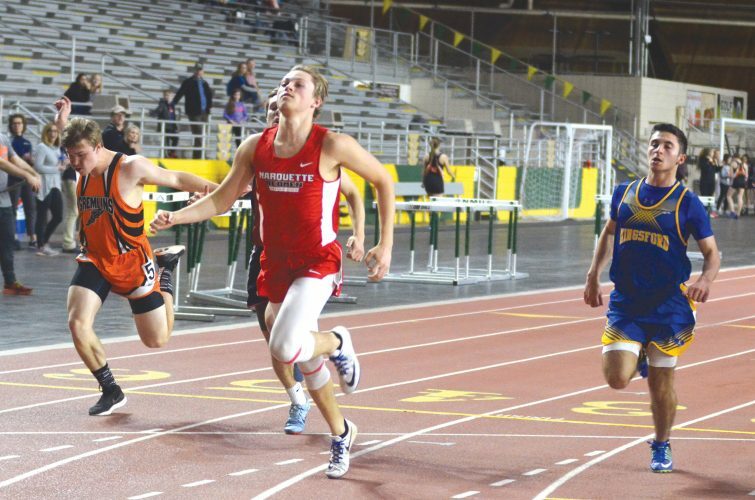 Michaelson was a standout football player who also excelled in basketball and track. He was the UP Back of the Year and a Class C all-stater in 1970. In track, he helped the Purple Hornets win the 1971 UP Class C track title by winning the shot put. “I feel grateful, excited and humbled,” Michaelson said. “I am glad to be representing Baraga County and Baraga County athletes at this stage. None of this would be possible without having great teammates and great coaches. Michaelson played football for two seasons at Mesabi, Minn., State Junior College, where he helped the team win the state junior college title while earning Junior College All-America honors in 1972. Michaelson also played two years of football at Eastern Michigan University. Mickelson, a 1936 Eben graduate who died in 2002, made the most of his coaching opportunities, including a lack of basketball facilities at Eben and track facilities at Munising. In basketball, he led Eben to Class D district titles in 1946 and 1947 while playing home games in Trenary and Munising. In track, he guided Munising to UP titles in 1957 and 1958. Mickelson’s cross country teams at Eben also won four UP titles. Mickelson was a catalyst to generate funds for a new Eben gym in 1950 and he led the fund-raising campaign for an all-weather track at Munising Memorial Field when it opened in 1977. “When he was fundraising, he said, ‘I’m the biggest beggar there is,'” said Don Mickelson, who was representing his late father. In his sports career, Mickelson set track records in the both hurdle events and broad jump. He also had a 55-year career officiating high school athletic events and was a member of the Army’s “Black Devils Brigade” during World War II.